Limited time only! Velocity: Christmas Sale Up to 50% OFF & Up to Additional 20% OFF for Members at World of Sports, Columbia & Salomon! With up to 50% off and up to an additional 20% off for World of Sports members, it will be a Christmas shopping spree at Velocity's World of Sports, Columbia and Salomon! Not a member yet?! Simply sign up at any of their stores in the month of November at just $39 and receive a welcome gift and two $50 vouchers! 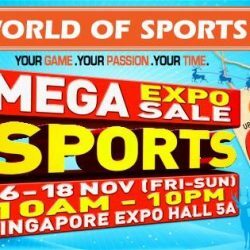 16 - 18 Nov 2018 World of Sports: Mega Sports Expo Sale with Offers on Footwear, Apparels, Equipment & Gear from Nike, Mizuno, Columbia, Spalding & More! 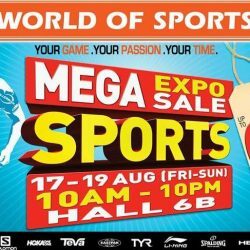 YOUR MEGA SPORTS EXPO SALE IS HERE! There will be a whole new range of footwear, apparels, equipment and gear for your Christmas shopping spree! Happening from 16th - 18th Nov (Fri-Sun), from 10am-10pm at Singapore Expo Hall 5A! Spread the word! We'll see you there! September is here and you’ve got 4 months to catch up with your fitness resolutions! Kickstart and get motivated with UP TO 50% off sports apparel, footwear and gears. Plus, get an extra 10% off with a minimum purchase of 3 pcs Mizuno apparels in a single receipt on 50% off and markdown items. Get 20% off NEW ARRIVALS and additional discounts if you're a World of Sports member! This promotion is available at all World of Sports, Mizuno, Columbia and Salomon stores! Terms and conditions apply. While stocks last! 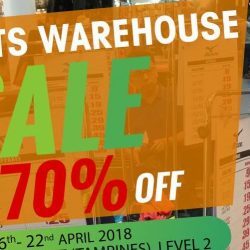 16 - 22 Apr 2018 World of Sports: Enjoy Up to 70% OFF at Giant Hypermarket (Tampines) Atrium Sale! 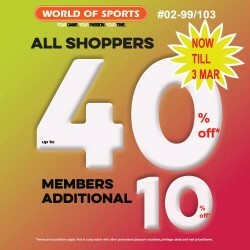 World of Sports is having an UP TO 70% OFF atrium sale at Giant Hypermarket (Tampines), Level 2 from 16th to 22nd April! 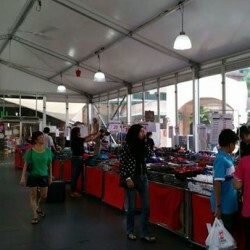 Check out the sports apparel starting from $9 onwards! 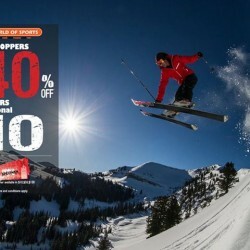 World of Sports: Enjoy 40% OFF Exclusively for Members or 20% OFF For Public! 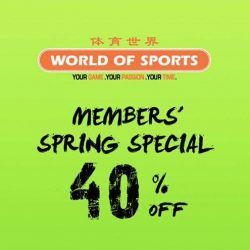 SPRING INTO SPRING SHOPPING WITH 40% OFF at World of Sports! Exclusively for World of Sports members! Not a member? Enjoy 20% off or simply sign up at any one of their stores today at just $39! 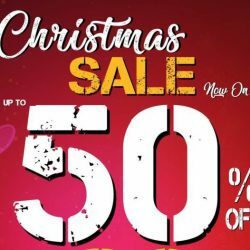 World of Sports: Festive Sale with 50% OFF Almost EVERYTHING! Be merry and bright for the festive season with 50% off almost everything at World of Sports! Get gifts for her, him, friends and family! Promotion is now on at ALL World of Sports, Columbia, Salomon and Mizuno stores! WOS Members enjoy up to an additional 10% off! Spruce up your Christmas shopping sports-style this year! 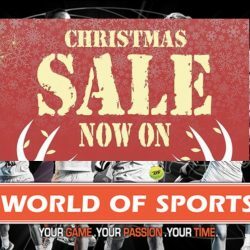 World of Sports Christmas Sale Now On! From 14 November - 25 December, all shoppers enjoy up to 40% discount, and World of Sports Members enjoy an additional 10% off. Time to load up your sporting gear now! 11 - 13 Nov 2016 World of Sports: Double 11 Sale – 50% OFF Almost Everything in Stores! From 11 till 13 Nov, enjoy 50% off on almost everything at World of Sports! WOS Members can enjoy an additional 5%! Promotion is valid at ALL World of Sports stores. 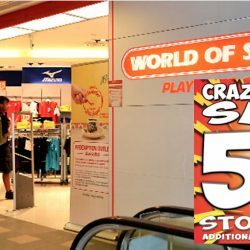 Till 30 Oct 2016 World of Sports: Crazy Sports Sale 50% OFF Storewide + Additional 5% For Members! THE CRAZY SALE YOU'VE BEEN LOOKING FOR! 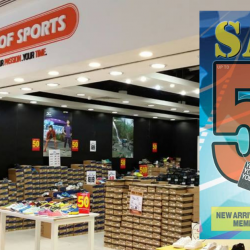 Enjoy 50% off storewide at 4 World of Sports outlets (Westgate, Tampines 1, Seletar Mall, Jurong Point) now! World of Sports members can enjoy additional 5%! While stocks last! Hurry now! Promotion ends on 30th October. Be like a champion! 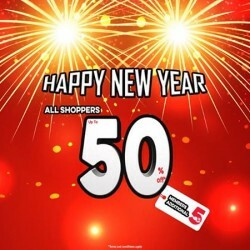 Enjoy $50.39 off* with min. $100 spent in a single receipt on all Mizuno products. 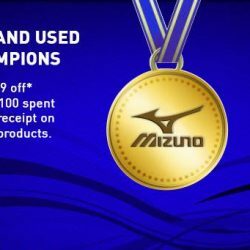 From now till 21st August 2016 , simply flash this image to the staff to enjoy the promotion at all World of Sports & Mizuno Stores (except Takashimaya). Good news for those who did not get enough of our Crazy Sales. It's extended to 9 August! Exclusively at Westgate, Plaza Singapura & Tampines 1. All shoppers get 50% off while members get an additional 5% off. Hurry down before all our stocks sell out! 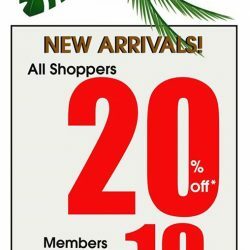 Check out our latest promo in stores, All shoppers 20% + additional 10% for Members. This promo will end on 4th August 2016. Its not too late to sign up for membership to enjoy more benefits! From now till Jul 3 (Fri to Sun), enjoy Hari Raya Special with 40% for MEMBERS ONLY at World of Sports, Mizuno, Columbia and Salomon stores. Hurry, sign up as a MEMBER now and enjoy the irresistible deal with attractive welcome gifts! Public get 20% off. T.G.I.F! Let's welcome the weekend with some retail therapy with our GSS sale. All shoppers get up to 40% off while members get an additional 10% off. Let's pass on this great news with everyone! Time to embrace the major sale event of the year! During this Vesak Day weekend, come to World of Sports stores and enjoy a variety of sporting goods at a fraction of it's original price! 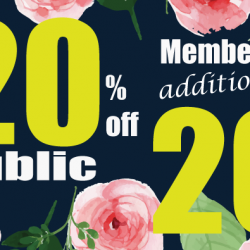 All shoppers can enjoy up to 40% off while members get additional 10%. Spring is the time of rebirth and inspiration. Every year during this season, you can find new products with improved technology and design in stores. For a limited time only, enjoy 20% off selected products, World of Sports members enjoy an additional 20% off!! So, take this opportunity to become a member and receive a welcome gift and $50 voucher (during your birthday month), all for only $39!! So, head down to your nearest store for more information. 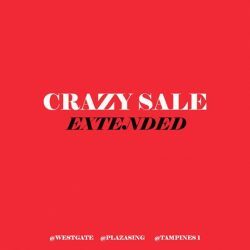 The Crazy Sale is back!! From 4 to 13 March, everything in World of Sports Tampines One, Plaza Singapura, 112 katong, Westgate, and AMK Hub is at 50% off! Hurry down and grab the best deals. Members get an additional 5% off. *Terms and conditions apply. Enjoy unbeatable deals at World of Sports, World of Outdoors, Mizuno, Columbia and Salomon this weekend. 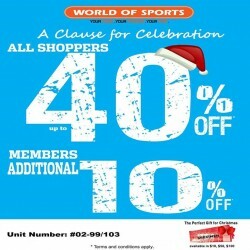 All shoppers enjoy up to 40% off and World of Sports members get an additional 10% off. So head down to the nearest outlet and check out their latest Spring/Summer collection today! Terms and conditions apply. World of Sports CNY festivities continue throughout this weekend with more new arrivals in stores! Get up to 30% off when you purchase selected S/S'16 shoes, apparels and accessories; members enjoy an additional 18%. In addition, all shoppers are entitled to an additional 5% off with a minimum spent of $288. 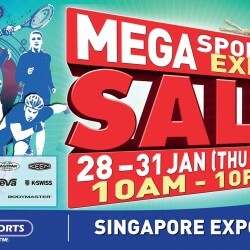 Keep to your New Year fitness resolution by heading to World of Sports Mega Sports Expo Sale this weekend! 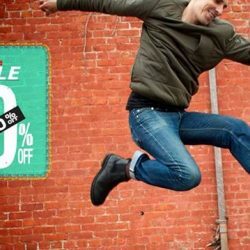 Grab bargains for sports apparel and equipment at this sale with up to 90% discount! Brands to expect at the sale: Mizuno, Columbia, Eastpak, Elle Active, Brooks, TYR, K-swiss and more. Enjoy world of sport for an major savings year end sale. There are loads on offer, including 50% OFF discount on mind blowing range of new products. 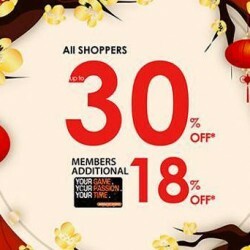 Plus all member get additional 5% OFF discount. Come and enjoy Sports Atrium Sale and save up to 80% OFF starts today at West Mall, Open Plaza. All of you around the area, do remember to drop by for great bargains off sporting apparels, accessories and shoes from brands like Mizuno, Columbia & Salomon. For a limited time only.While stocks last. Add a little razzle dazzle to your Christmas shopping at World of Sports. Enjoy up to 40% discount till 17 Dec, while members receive an additional 10% off. Terms and conditions apply. Come and enjoy for an little razzle dazzle to your Christmas shopping at World of Sports. Enjoy up to 40% discount this week while members receive an additional 10% OFF. Now, that’s a clause for celebration.